Diapers are second best friend that a new Mom has in her life(To read about first best friends click here). 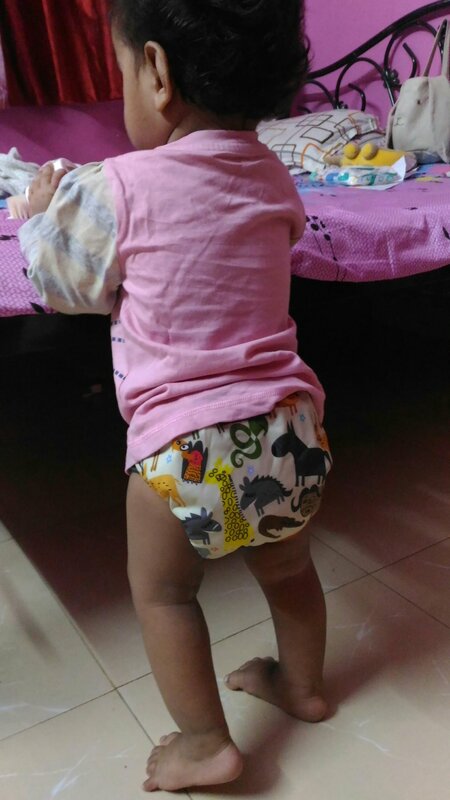 Diapers give her mind a little break from constant worry and stress how to keep her baby’s bottoms dry. In all the chaos of looking after a baby and giving him/her the best of everything, we mothers end up neglecting the most important part of our baby’s body i.e the baby’s bottom’s and without giving much thoughts, we put them into disposable diapers which are made up of non-degradable materials along with chemicals which cause harm not to the environment but to your baby’s bum too and that is why they end up getting rashes. Lets discuss about my journey to cloth diapering in detail in another post and discuss about the pocket cloth diaper that I recently got a chance to review Fig-o-honey pocket diapers. And I am very much impressed with the results. 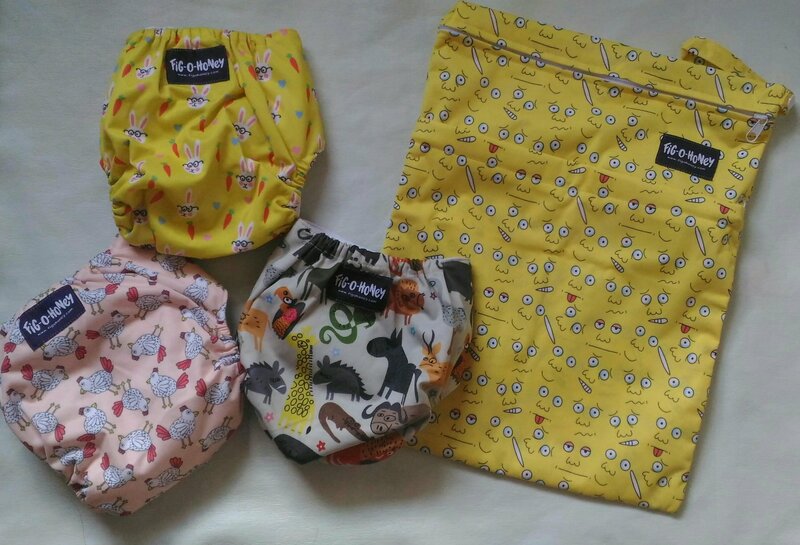 I was sent three pocket diapers with very attractive design and colour along with a dry/wet bag. the inner layer is made up of micro-suede which is known for its great absorbing properties. I soaked the diapers in cloth diaper friendly detergent(used rustic art here) in warm water and washed them in machine with one extra cycle to put off all the detergent that it absorbs while soaking. Fig-o-honey has a huge range of print variants to choose from, very bright and colourful that makes cloth diapering more exciting. There should be a snap button to attach the insert inside the pocket, it will help in the insert to last little longer. I give 4.5/5 rating to Fig-o-honey diapers. Hey people, hope you are all doing good. Today I am going to discuss about the first best friends in a new Mom’s life, baby wipes. Yes, Baby wipes is one such innovative product that can be used to wipe clean not only baby’s hands and face but also the bottoms. Now there are certain baby wipes in the market that recommend to use it either on body or bums. Some claim to be safe to be used on both. But I fail to understand how can a same product be safe for one part of the body and not on the other part? Baby wipes are convenient products which are used many times in a day on baby’s sensitive and delicate skin but the baby wipes that are present in the market now are mostly made up of polyester which is not only marked unsafe to be used on baby’s skin but also a non bio-degradable material and takes hundreds of years to get completely decompose. Chemicals have become a part of our life, they are present almost everywhere including baby products. If you’re like me, who have decided to make the commitment to stick to natural, non-toxic baby products as much as possible then Mamaearth Baby wipes is your thing. Mamaearth wipes is the India’s 1st Organic Bamboo based wipes. A startup By the parents For the parents which exists to solve seemingly little problems of young parents by providing certified toxin free, international standard products under the First MadeSafe Certified brand in Asia. The love for their baby made them paranoid about the choices they wanted to make for him, everything had to be right as they planned on having only one child.Due to lack of any regulations most products across categories available in India for babies were not safe. Some personal care products from prestigious brands had toxins which could be carcinogenic for their baby. Further they figured no other brand made in India provides 100% toxin free guarantee and had to order products from US & UK at steep costs. And there came the existence of the brand, so that good,chemical free, naturally made baby care products should be made available to all parents across the country. Almond oil, shea butter, aloe vera and Vitamin E all are known for their moisturising properties. Pried at 249 INR for a pack of 72 wipes is a very good deal. If you are looking for a safe product for your baby then it is a very minuscule amount. Right now, the wipes are available on the brands website (www.mamaearth.in) and http://www.firstcry.com. non-toxic products that are natural and nourishing and also will make your little one’s skin healthier. A company that specializes in manufacturing products that are based on views taken from a panel which comprises only Moms. For good natural and safe baby wipes, Mamaearth’s are the best. I like writing,its one of the most beautiful way to express oneself but I was missing in action from my blog for a brief period coz my duty as a mother who is raising a Mini tornado needs her attention 24*7,my baby is achieving new milestones with every passing day. Yesterday he was running behind butterflies in the park and today he wanted to answer the door….oh no, see I started flattering about my kid again.This is how motherhood has changed me,even at a minuscule chance I start praising all my baby’s up’s & down’s I would say Motherhood has not changed me, it has transformed me in an altogether different person that I once used to be. Motherhood has taken over an almost perfectionist personality of mine. # I used to hate to see my wardrobe disarranged, it used to be well stacked just like data in a data structure. But since Motherhood happened, I need to dive in the sea of clothes to find a t shirt that will go with my pyjama’s but my baby’s side is neatly arranged. There is no chance that you will disturb the full pants while pulling out the footsie’s. # From being a very passionate career-oriented girl to now a Stay-At-Home-Mother, this has been the biggest transformation ever happened within me. It sometimes does breaks my heart to see the World running ahead but hello I am a Mother and no job in the World beats that designation. #I am a self proclaimed Mom research analyst. I am always ready with examples to co-relate science with baby related things, be it cloth diapering or baby wearing or weaning. # There is zero scope to be selfish in this world of motherhood.You get the superpower of holding your pee for hours after being a mother as every second is important. Everything happens in a blink of an eye whether it is a milestone or a mishap and being a mommy you cannot afford to miss any of it. #Motherhood has also made me very brave. Brave enough to nurture a tiny being into a good human. Taking brave decisions to be by my son’s side 24*7. I don’t want to miss all those first’s first that my son is going to do in his life. I want to be with him when his eyes look for the safest place to rely on. I want to reach to him,console when he falls and push him to attempt that step again. I want to be close to him when his arms are crying for his “Mu-umma’s” hug. I want to be present for him for the time when I AM THE MOST IMPORTANT PERSON IN HIS LIFE. I love spending time in kitchen cooking for him. I love folding my little man’s laundry. Oh, and I am the spookiest one when he does not poo or pee on time. Running behind him is my favourite-st thing right now. I don’t care if I have not combed for a week or taking baths in evening. Watching movies or catching some drama’s on drama fever seems like a blurred vision. I am as fresh as a daisy even if my son has kept me up till mid-night, slapped and kicked to wake me up early in the morning. I had mentioned in my earlier post that another name for Motherhood is madness(you can read it here) and I have been living in this madness since fifteen months and have enjoyed every span of second spent in this magical world. Motherhood is a feeling which cannot be described in few words but can be felt within. This post is a part of the blog train- 2 started by Pooja Kawatra of Mums & Babies where she has brought together mothers from across the globe. Do read her blog post on How Motherhood has changed me – http://www.themumsandbabies.com/2017/09/how-motherhood-has-changed-me/ and more on the blog train here. Hop over to the lovely Gayathri’s page who is a software engineer turned FTM to two adorable girls! Loves staying connected to nature! Believes in natural parenting, montessorri and just following the children.Believe in taking one stride a time and as the life leads to know about her journey, here.